In honor of National Margarita Day…I couldn’t help myself. I have actually been working on this recipe for a magazine article set to publish this coming spring. The recipes are meant to be light and fresh, this one definitely fulfills that. Pop kernels over stovetop in a little bit of oil or in an air popper. Combine popcorn and toasted coconut, set aside. Combine simple syrup, zest and sea salt. Pour half of syrup mixture over popcorn and toss. Repeat with remaining syrup mixture. Season with extra salt, if desired. 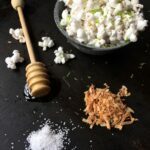 This popcorn doesn’t need the extra oil, but it you prefer it: heat coconut oil in microwave and add 2 tablespoons of regular honey (skip the simple syrup). Stir to combine, add zest and sea salt; toss mixture with popcorn. For the Honey Simple Syrup, combine water and honey in a small saucepan over medium heat. Heat until honey is completely dissolved. Remove from heat and allow to cool. Can be stored in refrigerator for several weeks. This Honey Simple Syrup is also great for sweetening cocktails.